Onward to knitting content. Here’s what I’ve been working on this week. I have more complicated things on the needles, but this week was stressful, and all I wanted to do was decompress with knitting easy enough to do while watching DVDs. I’m currently working my way through Twin Peaks, Season 2. I actually finished most of this while listening to Stash and Burn this morning. 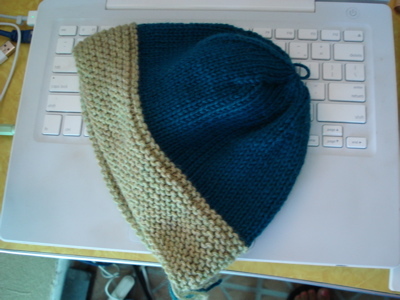 I’m thinking that it still needs a turquoise and light green pom-pom, so I haven’t woven in the end up at the top. I used the basic women’s hat pattern with the garter brim in LMKG, but stopped at about 6 inches, rather than the recommended 6.5 . I think I have a small head! The yarn is Cascade 220, left over from my very first (and sadly, quite ugly) knitting project, a garter stitch, thick striped scarf. I did a bad job choosing colors, and I don’t think I will ever wear it.